Interests - Loves dogs, Barbie, Moshi Monsters, crafts and creativity, being read to, anything girly or sparkly, Looney Tunes, Mickey Mouse Clubhouse, Lego, being in the garden, swimming, loves school. Visually/hearing impaired? - Low frequency sensori-neural hearing loss (unaided at present). We knew it was likely Eloise had CF from the 20 week scan when I was pregnant as it showed echogenic bowel and consequent tests showed her dad and I were both carriers. It came as a huge shock as there is no history in either family but a chord blood sample of birth confirmed CF. We were extremely lucky in that despite the echogenic bowel, Eloise didn’t have meconium ileus. She spent a week in the special care unit, being fed by NG tube for some of that time as she kept vomiting up whole feeds, and having IVs. Her first routine medications of vitamins, prophylactic antibiotics, Creon and physio, were started on day eight and we quickly settled into our new routine. However, by the time we went to our first clinic appointment at two weeks old, we’d noticed she wheezed and coughed a lot. At six weeks old she was prescribed an inhaler and was started on her second course of extra antibiotics for her cough that she’d had since birth – nothing seemed to help her cough or her wheeze. She was still vomiting up whole feeds and was unsettled and distressed too, so we started her on drugs in case she had reflux. By the time she was two months old nothing had changed and our local consultant arranged for an immediate outpatients appointment at our specialist CF Centre in Cardiff. The CF specialist listened to her chest and admitted her there and then for two weeks of IV antibiotics, a bronchoscopy and a pH study to see what was happening in her lungs and whether she had gastro-oesophageal reflux. The pH study was inconclusive but she was started on omeprazole anyway and this helped quite a bit with feeding and weight gain. The bronchoscopy was invaluable for us as it got to the bottom of why Eloise coughed and wheezed so much – she was diagnosed with Tracheobronchialmalasia which basically meant her windpipe and airways were extremely floppy where the cartilage should have been stiff. They also warned us that her threshold for infections would be much lower as a result and she’d probably need IVs more than most little ones her age. For the next 10 months we fell into a stressful pattern of being on oral antibiotics for a fortnight and them not working and then ending up in hospital for a fortnight of IVs as a result, often requiring oxygen. By the time she was four months old, venous access was so impossible that they stopped the course of IVs at our local hospital and put her on the emergency list for a portacath (permanent IV access) in Cardiff. The operation went well but two days later she was rushed to the high dependency unit and put on cpap, although we never really got to the bottom of why that happened. She was started on immunoglobulin therapy at 10 months old to try and help prevent so many infections and improve her wheeze, as well as already been on orals, 2 inhalers, multiple nebulisers and physiotherapy twice a day. 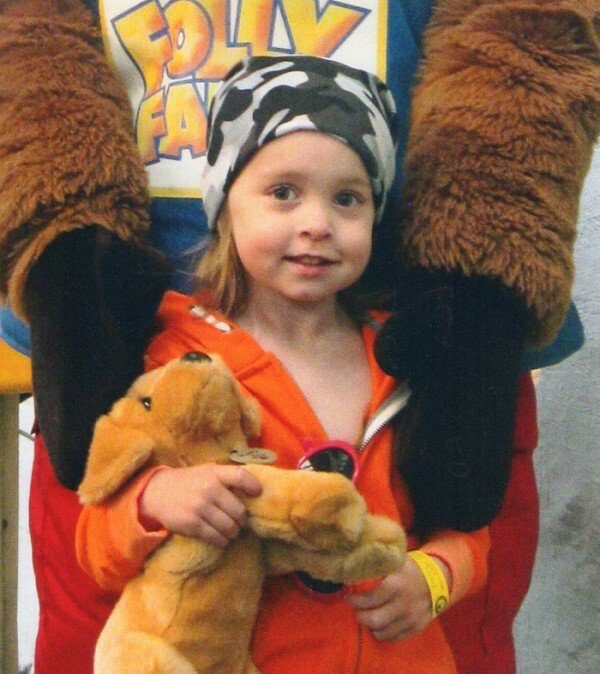 Things did gradually improve in her second year and we had less admissions – 6 as opposed to 12 – and managed to stop the IVIg, but we continued to add medication to her routine on an almost monthly basis. Due to swallowing issues she had a repeat pH study, videofluoroscopy and a laryngoscopy in Cardiff where a speech delay was flagged up – we discovered she has bilateral low-frequency sensorineural hearing loss as well as quite bad glue ear, so she ended up with a hearing aid, although she manages without this at the moment. When Eloise was three, with all the chest issues ongoing, we began to have the bowel troubles that we thought we’d escaped when she was born and she was diagnosed with Distal Intestinal Obstruction Syndrome (DIOS), which continues to be a big issue now and we are looking at other tests to rule out a problem other than her CF. Over the last couple of years she has grown H. influenza, Acinetobacter and isolated Pseudomonas, and she now has a chronic Pseudomonas infection that we have been struggling to get on top of since January 2012. Her weight has been a concern for the last 12 months but some of this is related to the DIOS, as when she is blocking it affects her appetite, so she has daily supplements and fortified food beyond just adding butter and cream. Eloise is a very happy little girl but she has to cope with a lot, even if she does smile her way through most of it. As well as her physical health, we’re also waiting on a referral to see if she is on the autistic spectrum and she has speech therapy at regular intervals. At present she routinely has a minimum of 6 puffs of inhalers, 5 nebulisers, 2 lots of physio, 6 sachets of laxative, around 30 tablets and 5 liquid orals a day, and she is admitted for two weeks IVs in hospital every 12 weeks when well, but more frequently if needed. Eloise is now moving on from Post Pals. Thank you to everybody who has ever sent post to Eloise. Yet again I find myself apologising for the long delay in sending an update – there’s been a lot going on and some big changes for all of us. I’ll start by saying that Eloise is in the best health she’s been in for over 2 and a half years and it’s a wonderful change for all of us. The admission to the Children’s Hospital in April was mostly uneventful and marked a steady improvement in her health following the bronchoscopy. She had 14 days IVs in the end as when they looked in her lungs there were markers of infection, but there wasn’t a great deal of mucus present which means that the physio we’re doing is helping keep her clear. Whilst none of the medics can explain it, within 7 days of the bronchoscopy the breathlessness was virtually resolved, the turning funny colours had stopped and her sats were steadily sitting above 94% for the first time in almost 9 months – she even hit 100% on a handful of occasions. Cultures from her lungs grew 2 bugs, but neither were ones that the team tend to treat. There was no growth of the bad bug we thought she had a permanent infection of (Pseudomonas Aeruginosa), however she has grown it again since, so we’re still not sure what the situation is there but as long as she’s keeping well we can live with not knowing for now. As well as the exercise tolerance test and bronchoscopy, Eloise also ended up on cardiac monitoring for 24 hours as there were some anomalous readings during her tolerance test, however the results from this were also fine. A highlight of the Cardiff admission was that we got to meet Jenny, one of Eloise’s assigned writers, and much fun was had playing Uno, chatting and generally having fun! She had a little wobble a couple of weeks after being discharged and we had 3 weeks where her health was not the best again – a return to similar symptoms of breathlessness coupled with a cough, lower sats etc. but she battled on continuing to go to school where she could and after a switch in antibiotics we began to see some improvement. It took about 6 weeks in total, but she is now doing brilliantly and for the first time since the age of one we’ve been able to postpone her routine IVs – she’s now gone 14 weeks and there is no sign that she will need to go in any time soon. I’m trying not to get too excited, but this is a big achievement for her and we’re hoping it lasts for a while. The only concern anyone has about her at the moment is her weight as she’s lost a fair bit so we’re getting as much food and as many supplements into her as we can until she’s next weighed to see if we can stop the decline. In May, we gave Eloise a choice to make: a holiday or a puppy. Surprise, surprise she chose the puppy and Marley the golden labrador joined our little family very soon after. She absolutely adores him although her behaviour does pose problems with him from time to time; thankfully he’s an extremely placid and accepting dog and a real joy to have around. Walking him is also excellent exercise for her and she frequently takes either her bike or her scooter. Another impending change is that from the 12th August I will be returning to full time work – I’ve been working part time from home for the last 18 months, but haven’t been able to go back to full-time employment since Eloise was born, so this is a huge step for all of us. Derek will be taking over the majority of the caring role – I’m finding relinquishing a lot of her health and care responsibilities very hard and very scary, but it’s a step that I need to take. Thank you so much for all of Eloise’s post over the last few months. She’s had some very thoughtful letters, cards and parcels and has loved opening every single one. I would love to thank everyone individually but there’s just too many to list. I don’t know where we’d be without the wonderful people that send her post – it’s a real help in keeping her cheerful at a time where she’s realised she’s different and doesn’t want to have cf any more. THANK YOU. Yet more apologies for another delay in updating Eloise’s page. January, February and March have also been mixed months. The issues I put in her last update are still on-going and she’s being admitted to the Children’s Hospital tomorrow for a minimum of 6 days for tests and to start her routine IVs. The blood tests done at the start of her last admission all came back fine which is both good and bad from our point of view as we’re obviously looking for a cause to the symptoms she has. The only thing that was flagged up was a historic infection of the Epstein Barr virus which causes Glandular fever, however she’s never exhibited any signs that would have led us to believe she had it or that lasted more than a couple of days. Her IVs in January were thankfully smooth and without any real hitches although she continues to be quite out of sorts for the first 48 hours or so, and the rest of January continued without anything new cropping up. At the start of February she caught a bit of a cold but it passed within 48 hours, however 48 hours after that she started coughing. We put her on secondary antibiotics but she continued to cough throughout the course. As she was due to see the specialist team for annual review at the end of February anyway she was given a third week of orals, however half way through her cough turned very nasty and we ended up switching to something stronger. To be honest it was the worst cough we can remember her having in the last couple of years and I was all prepared for her to be admitted for IVs when we saw the teams at annual review, however they were pleased with how her chest sounded and she did respond to the switch in orals after a few days. Annual review was ok. We had no nasty surprises, nothing that we didn’t already know and in many respects was very positive. The physios were extremely happy with the work Eloise is doing and all the extra exercise she does. The dietician was satisfied in that she’s not losing weight, describing her as static at the moment, however she did go on to say that if she begins to lose weight or she remains static for a while we would need to look at other measures to help her gain such as NG feeding. This is something that has been mentioned in passing during most of our meetings over the last 12 months so wasn’t a shock or upsetting, and in actual fact she’s sitting on the 25th centile for weight so it’s not even imminent. It’s just something to be aware of, particularly as a large proportion of her nutritional intake is already being achieved through the use of multiple nutritional supplements each day. The doctors were also pleased with how the year had gone although agreed that a bronchoscopy under general anaesthetic and exercise tolerance test would be a good next step in trying to work out the cause of her current issues, hence the admission tomorrow. She’ll be in for at least the next 12 days although hopefully transferred back to our local hospital for the second half. And hopefully we’ll have some answers by the end of it all. March was a bit of an odd one. On top of the breathlessness and other issues she’s been getting excessively tired and that’s made everything seem a bit of an uphill struggle for her I think. She’s been very irritable and quite tearful which isn’t like her at all. She thoroughly enjoyed her birthday – we settled on a party at the local football club with an entertainer as she wanted to invite the whole class. They did circus skills like plate-spinning, had a magic show and then a bit of a boogie for half an hour. Eloise was thrilled as she got to be one of the magician’s assistants, although her favourite part of the whole party was when she blew out her candles and everyone clapped and cheered. She had a cake in the shape of a scottie dog and bone as the dog obsession has increased to infinite proportions and we are very seriously considering buying her a puppy once we return from our holiday in the summer. Thank you so much for all the beautiful cards and gifts she received; just like Christmas we were overwhelmed by the number of people who had taken the time and effort to send her something. I have posted some more photos to the photo album I keep on facebook of her opening post and will share the album with the Post Pals page so that people can see the smiles they bring. Eloise has received a vast amount of post over the last three months and it all makes such a huge difference. We can’t thank everyone enough. Each time I try to come up with the words to express what it means I get stuck so… thank you, thank you, thank you. It’s been a mixed couple of months and apologies for the delay in sending an update. Eloise had a pretty good run October to November although there were still a couple of underlying issues and then things went a bit haywire after an amazing weekend in Cardiff for Children in Need. Since September there has been an on-going increase in breathlessness on exertion that we haven’t really resolved. It’s not upsetting her, but it is having an impact as she’s been getting breathless doing things that have never been a problem before and it’s taking her longer to recover than usual – she’s such an active child that it is rather obvious at the minute. Her local consultant managed to squeeze her in before school the second week in November and did a chest x-ray that I’m sort of pleased to say came back unchanged from last March. A couple of cough swabs were taken – one for the ‘usual’ bugs that can cause problems with CF lungs and one for more unusual, slow-growing bacteria called mycobacteria – and she was started on secondary antibiotics on the off-chance she had an infection and an asthma tablet to damp down inflammation in the lungs. That weekend we were in Cardiff having been invited down for a live taping for Children in Need and she had the most amazing time – she was shown round backstage by Gethin Jones and spent time with Sophie Evans who she absolutely adored when they met filming on the ward in October. The BBC put us up in a beautiful hotel and we went down on the train as she was desperate to ride on one but we hadn’t been able to do it previously. She seemed a little subdued whilst we were away but we didn’t think much of it. On the Monday we took her to football training and she was stopping to catch her breath and sitting down a lot – when she came out, all around her nose and mouth was a horrible grey/blue colour. We took her in to be seen on our local ward, but their view was that as her lips and fingernails had remained pink they weren’t concerned. That night when I checked on her before bed she looked horrendous – same horrible colouration but also flushed and sweating profusely – she has been having perfusion (temperature/sweating) issues since July which had been somewhat dismissed. I rang the ward and spoke to the registrar for advice, however the view was still the same – not concerned. I wasn’t happy and sat up with her to make sure her breathing remained ok and the following morning, having spoken to her team, she was started on a hefty 5 day course of steroids. She was seen in clinic 3 days later, and although she was still turning funny colours, breathless on exertion, having sweats and temperature issues, for the first time ever with her local care I was not at all happy with the response we got. The additional medication made no difference although she was given another 5 days of steroids and this did eventually help with the colour issues. Having said that she couldn’t find anything wrong with her, the local consultant told us that if she was no better by the Monday she’d ask our specialist centre to see her – long story short we had to wait over 3 weeks for them to see her and were told the only reason they were was because there was a cancellation in joint clinic at our local. I felt like we were being dismissed again, however the long and the short of the appointment was that they’re going to run a number of blood tests when she’s admitted tomorrow (Jan 7th) looking at a number of things: tests for CF Related Diabetes (she’d be very, very young for this), full liver and kidney checks, serology to make sure there isn’t a viral culprit such as glandular fever, iron levels and the usual tests she has at the start of an admission. They’re also going to do a Mantoux test for TB whilst she’s in, however we were told that this is *extremely* unlikely and it’s more for the sake of being thorough. The view is that if all these come back normal then we can be fairly confident that there is nothing chronic underlying, however it still won’t explain why there’s been a change in her condition since the summer. We were hopeful when the cough swab they took on the same day came back with a growth of a bacteria called Citrobacter Werkmanii that we’d found the cause, however after two weeks of very strong antibiotics over Christmas, nothing has changed. The specialist team also started her on a proper steroid inhaler, however this hasn’t helped either. On the bowel side of things, we’ve done another clear-out since the last update. How she happily drinks 10 sachets (625mls) of movicol a day I have no idea – she never ceases to amaze me! It’s helped though and we’re actually managing to go quite a while between clear-outs at the moment which is a big positive. She is complaining of tummy pain every now and then, but for some reason we can’t seem to get her pancreatic enzymes exactly right at the moment so we (hope!) think it’s probably cramps due to that. Not CF related but a stressful experience for all of us was that Eloise somehow managed to sustain a gaping 2 inch wound to the back of her leg whilst in the bathroom at the end of November. She’d gone up to use the toilet, and whilst we still don’t know exactly what happened, we think she was messing about and caught the back of her leg on a free-standing, chrome toilet roll holder. At first we didn’t even know she’d done it – she was crying so we raced up the stairs, but the wound was on the back of her leg and there was no blood. It was only when I’d got her calmed down sat on my lap that she said her leg hurt and we turned her to look. I’m not squeamish but it was the most awful thing I’ve seen – suffice to say we were out the door to A+E with a clean flannel clamped over it very quickly. On first inspection we were told they thought it might need surgical input it was so deep, however one of the consultant’s examined her and said that it had missed the muscle by fractions and he thought it could be closed in A+E. Had she needed surgery we would have had to be transferred to the Children’s Hospital in Cardiff, as they won’t put her under or sedate her heavily without the back up of an intensive care unit. As it stood, she’d only finished her steroids a couple of days previously so they weren’t prepared to give her anything other than local anaesthetic. They put a topical gel on, but A+E was incredibly busy and unfortunately they left her too long so when they got to her again she ended up having to have local injected around the wound. She was absolutely amazing, really, really brave right the way through – I know how much I hate local anaesthetic. She ended up with 9 stitches, however the wound split when they took them out after 14 days so it’s still not fully healed now – she heals very poorly, one of the reasons why we’re looking to see if she has EDS. We had our appointment with the genetic counsellor regarding the EDS in October and will now have to wait 6 – 9 months for her to be seen and examined by the consultant geneticist. The counsellor gave us no indication either way as to what she thought, however we did establish that there’s some ‘bendiness’ in both families and early onset arthritis on Derek’s side of the family, so we may not be barking up the completely wrong tree. We also had our long-awaited appointment to discuss her behaviour, and whilst it was said she’s not ‘obviously autistic’ she definitely does have a number of autistic traits and it needs to be looked at further. As a result, the educational psychologist has been asked to go and see her in school, and the children’s disability team have been asked to offer us additional support until the consultant sees us again in 6 months. There does seem to be a view with a few people we have talked to that due to spending a lot of time in hospital when she was younger, it may have produced some sort of slight social/emotional developmental delay – the 6 months is to see what, if anything, improves or changes in that time. For us, it’s just a relief that someone else sees what we see and acknowledges that there is something not quite right – for the last 3 years all we’ve had is people telling us she’s ‘fine’ and dismissing all our concerns. We also saw ENT a couple of weeks ago, and whilst she doesn’t have nasal polyps, the lining of her nose is very red and inflamed so she’s been started on a nasal steroid spray. Health aside, Eloise is looking forward to getting back to ‘normal’ – she’ll be late returning to school due to her admission and she’s missed weeks of swimming, gymnastics and football due to both her health and her leg. All things considered she’s handled it all really well, however I know it’s unsettled her and she still doesn’t really understand why these things happen. We’re starting to think about what we’re going to do for her birthday in March and also looking at her starting things like min-hockey, karate and trampolining – she won’t be able to do them all, but even if we can’t resolve the breathlessness issues she has so much energy to burn that more outlets can only be a good thing! Eloise had a good Christmas health wise despite being on antibiotics, although she seemed to struggle a lot behaviourally and emotionally with the changes it brought. Thank you so much to everyone who sent post in December – she received well over 100 beautiful cards and a number of lovely presents: craft materials, stickers, a much loved sleeping cuddly puppy, a beautiful hand-made skirt, a Barbie dress up doll book, a peppa sticker book… the list goes on and on. She received post from mainland Europe, America, Australia and Japan! The parcels included wonderful gifts from her two ‘Elves’ – thanks so much to you Laura, Rich and Doug Dog, and to Emma, John, Johnny and Harry (she very much liked that you thought she looked like a princess and she laughed out loud at the photos!). Also, thank you to Father Christmas’s ‘reindeer’ who took time out of their busy schedule to drop her a line – she loved receiving those letters. Whilst I’d love to thank everyone individually, there was so much post that it’s almost impossible to do, all of it brought smiles and was very much appreciated. I would however like to say a special thank you to all the school children who sent cards to her – she loved hearing about all the children’s favourite things so thank you so much. And also thank you for all the effort the teachers must have put in to encourage the children to make and write in the cards. Eloise has received a vast amount of post since my last update and all of it has been a blessing and brightened some cloudy days: whilst Eloise is not ‘unwell’ at present, it’s very rare we go more than a week without there being some sort of issue or something becoming more problematic or changing. I will be posting a few photos to the Post Pals Facebook page once Eloise is discharged in a couple of weeks to share the smiles you’ve all brought. Here’s hoping for, and wishing everyone, a happy and healthy 2013! Following on from last month’s update, Eloise has remained fairly well, however there have been both bowel and chest issues on top of her routine admission for IV antibiotics at the beginning of October. She seemed to be getting quite blocked up again, so we did a weeks clear-out with an increased dose of movicol mid September, and at the time of writing the last update she’d just been started on 3 weeks secondary antibiotic for breathlessness and cough although was well in herself. The cough did appear to clear up and she stopped being so productive with physio with the antibiotics, which we were pleased about, however she remained more breathless than usual and even post IVs she’s still getting out of puff quicker than she was over the summer. IVs were a mixed bag. She was admitted on the Monday and started vomiting and spiking temps on the Tuesday which lasted into the Wednesday, however by the Thursday afternoon she seemed back to her more usual self – our first thought was line infection, however it thankfully turned out to be a bug. About 6 days in she began coughing and bringing up a lot of mucus, however this settled down by the end of the admission. We raised concerns about her body temp again whilst in – over the summer she had been complaining of feeling really cold, sitting fully dressed with two blankets on when it was 28 degrees outside on one occasion, however we’d been told it was a bit vague in clinic at the beginning of September. Whilst on the ward she was complaining of feeling extremely hot too, her perception of her body temp swinging wildly within the space of a few minutes, however a couple of times her core temp seemed to have dropped: she’d been out playing in the ward garden on a fairly mild day with a coat on and when she came in she was dripping in cold sweat and her temp was 34.3! We’re now going to keep a temp record for a few days to see if she is having a lot of dips, particularly as a blood glucose reading came back normal during one of many cold, clammy episodes on the ward. Other than the temperature issues, the rest of the admission went well and we did have a really exciting day when Eloise and I spent 6 hours filming with the BBC for a Children In Need appeal film to be shown on the annual night in November. Eloise was a little star, doing 4 or 5 takes of some things without complaint, and was given many compliments by the crew. 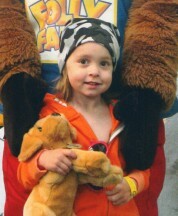 Most importantly she loved every second, particularly when Pudsey Bear came to the ward! She also made a friend in Welsh star Sophie Evans (runner-up on ‘Over The Rainbow’) who was the special guest doing the piece to camera and the voice-overs for the film. I’m so glad we agreed to do it as she had an amazing day and is excited about the prospect of being on TV. The dieticians and physios are happy with things at the minute, although some advice is being sort from a psychologist over the best way to handle her eating; at present she prefers to be fed – if you leave her to feed herself she won’t really eat which is becoming an issue. We’ve tried explaining to her that if she doesn’t feed herself she’ll end up hungry as we’re not going to feed her anymore, but she’ll quite happily hardly eat for 2 or 3 days when we’ve done this and obviously that’s an issue from a weight gain point of view. We’ve a fairly busy month to come – we have an appointment regarding her behaviour on Monday (October 22nd) and we’re seeing medical genetics on October 26th regarding the EDS query. She’s having a SALT assessment to see whether she needs more speech therapy at the start of November, and no doubt we will be in cf clinic by the time I write her next update. The ENT appointment to see if she has nasal polyps has been cancelled, so we’re waiting on a new appointment for that. Eloise has received some lovely letters, cards and postcards since the last update, she’s also received a colouring book, stationery from a couple of people, stickers, moshi magazines, face paints, a flying hamster (big laughs!) and Dottie post. So, in no particular order, I want to say a huge thank you to the following people for the last month’s post: Sarah, Stefanie, Karen, Alison, Jen, Heikki, Rissy and Harry (and lola! ), Natashja, Hilary and of course Post Pals for the regular post, face paints and flying hamster – I have photos of a tiger prowling round the house to share with you when I get round to updating the facebook album. A special thank you goes out to pal Adam W and his sister Hannah for their post – she was really chuffed to hear from another Pal. I hope I haven’t forgotten anyone, and sincere apologies if I have, but I’d like you to know that all the post Eloise received this month has put a big smile on her face and made her a very happy little girl, which makes me a very happy and grateful mum. Although Eloise is new to the website, she’s been an ‘unofficial’ Pal since around June, and quite a bit has happened since I wrote her story in the spring. Things have been a bit mixed really and whilst she hasn’t been really unwell there’s been a lot going on with her health. Chest wise, Eloise has grown Pseudomonas twice recently – once in March and again at the end of April – which takes the tally to 4 for 2012, 7 in total since November 2010, and leading her team to conclude that she now has a chronic (permanent) infection. Whilst on the whole she remains pretty well with it, statistically it’s not good and we had always held out hope we would reach a stage where she could go longer than 3 months between routine admissions – that’s now very unlikely. She was seen in joint clinic on Friday and started on 3 weeks secondary antibiotics due to being breathless and having a slight cough, the assumption being it’s probably pseudo again. The good news is that other than her routine fortnight stays in hospital in March and June, and one other short admission, she’s not had any additional stays. During her admission in June she had a rather nasty allergic reaction to Ceftazidime which has been one of her constant IVs since she was born – not a huge problem as there are lots of others she can have, however the horrendous rash, swelling and itching were very unpleasant for her. She was so good at trying not to scratch, a real trooper as always! Her port has thankfully been behaving really well after she was really poorly with suspected line sepsis in March. Her next planned admission is for two weeks starting on October 1st. Bowel wise, Eloise is having continued constipation and obstructions in her bowel despite a massive daily dose of laxatives, and movicol clear-outs being required every 4-6 weeks, and ended up having a single dose of gastrografin during her admission for IVs in March and a separate 3 day admission for gastrografin in May. The first time we attempted to give her gastrografin she ended up vomiting most of it up so were prepared for the prospect of giving it via NG tube as this time it had to go down and stay down – it would have been hugely traumatic for her as for a good 18 months she had a total phobia around her nose and mouth after having a probe put up her nose for a pH study. Although it tastes absolutely revolting, she took it with very little fuss and managed to keep it down this time. It worked really well and thankfully cleared the obstruction, however the morning we were due to be discharged she woke up vomiting and lethargic due to dehydration – gave everyone a bit of a fright when she started being sick and keeling over sat on the commode, but in true Eloise style she bounced back very quickly and we managed to get home the same day. Over the summer she’s been tested for Crohns, Coeliacs and thyroid issues but these have all come back negative. She also did a 3 week stint on a completely dairy free diet in July to see if a dairy intolerance was a contributing factor, however this had absolutely no effect and the specialist team from Cardiff are fairly convinced that it is purely a CF issue. We are not quite so convinced and are debating whether to push for a referral to a gastro specialist, but we’re still waiting on an appointment with a geneticist to look at the possibility of her having Ehler Danlos Syndrome (she’s hypermobile, scars easily, heals slowly and a couple of other things that could be related) which could contribute to the extent of her bowel issues. The plan now is for more frequent use of gastrografin as this does work for her even if it is foul. As a result of her bowel issues, Eloise’s appetite is horrendous at the moment and no amount of chocolate will tempt her. She is eating, but in an effort to try and maintain (and gain) weight, she’s having a large volume of high energy drinks like Fortini and we’re now adding even more supplements to her food to increase the calorie content of what she does feel like eating. The good news from clinic on Friday is that despite her lack of appetite the supplements are working: she’s gained 0.5kg in 7 weeks which now puts her on the 25th centile for weight, a position we haven’t been in for a long time. She’s actually gained more weight in the last 4 months than she did in the whole of the previous 18, which is fantastic! Due to snuffliness, we now suspect Eloise has nasal polyps, which is a minor issue in the grand scheme of things, but does mean another doctor involved in her care. She has an appointment with an ENT surgeon in November to confirm if she has them and see what treatment they require. Dehydration has also been quite a big issue over the summer even though we didn’t have much warm weather – there was one day she had nearly 1500ml of fluids but the next morning she still woke up dehydrated enough to make her sick. Hydration issues aren’t too unusual in cf and her doctor’s think her bowel issues are probably contributing, so we’re now encouraging her to drink as much as possible and have increased her daily salt intake which does seem to be helping. Her behaviour issues worsened before the end of last term, probably because the holidays were approaching, and as it’s now having a significant impact on her cf care, the referral to see if she’s on the autistic spectrum has been brought forward. Health aside, she’s really glad to be back at school and we’re fortunate enough to have kept the same support worker to manage her treatment. She’s back swimming, doing gymnastics and starting football training after school today – great fun for her but also really good for her chest! We had a nice two weeks away with family and at Butlins over the summer and have booked to go back next year – something to look forward to and she’s already talking about going to see the pantomime again it made that big an impression! Thank you to everyone who has sent Eloise post over the last couple of months – it’s generated real smiles at a time when they have been few and far between. Amongst others, she’s had a huge selection of postcards, moshi monster stuff, stickers, letters, jigsaws, a felt elephant, a quilt through Project Linus, books, as well as colouring pens, a party bag from the PP summer party and of course, Dottie’s brother arrived with us in July. Spot is a very welcome addition to our family and has already been on a few adventures. I had made a list of what she’s received and who sent it, however this seems to have gone astray at the moment, so can I just say a huge THANK YOU to everyone involved in the running and organisation of Post Pals and to all the lovely people who send post to these children. We see first-hand the difference you are all making and it’s amazing.